According to an official announcement, Coinbase Wallet private keys which are encrypted can now be stored on Google Drive or iCloud. Coinbase says that with this new offering, users will be safeguarded against losing their private keys, which is a common problem today. This leads to users losing access to all the crypto funds locked in those wallets. Coinbase says that at this time, the private encrypted keys that have been generated and stored on a user’s phone is the only way that they can access their cryptocurrencies on a Blockchain. The price of Litecoin (LTC) has rallied strongly in the first 6 weeks of this year. This has triggered speculation that investors could be buffering up prices in anticipation of the cryptocurrency’s halving that is scheduled to take place in August. At the time of writing the world’s fifth most valuable crypto is being traded at a price of $43.69. 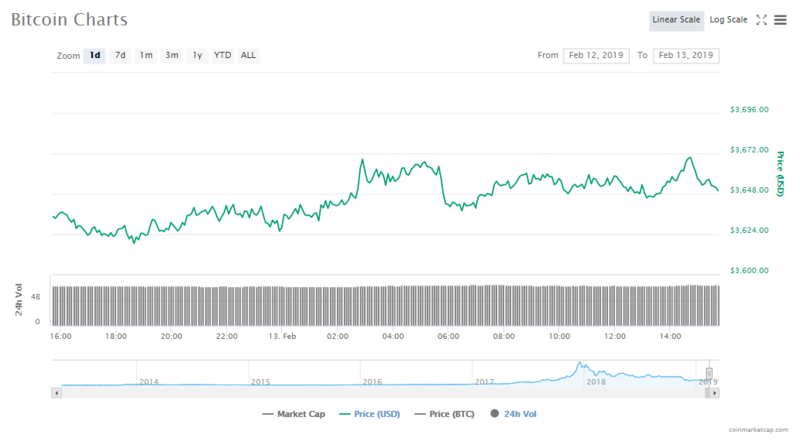 Last week, the crypto’s price hit a high of $47, which was a gain of 57% year-to-date. LTC’s rally comes 5 months ahead of the time that its supply will be halved. From August 8 onwards, the number of LTC awarded for mining will drop from the current 24LTC to half, which is 12.5LTC. According to the founder and Chief Executive Officer of the online retail giant Overstock.com Patrick Byrne, Blockchain technology could stop bribery in governments. Byrne, in an interview with MarketWatch, stated that government services had reached the point where there needed to be fundamental changes made to their infrastructure and that Blockchain technology would be the best replacement for current systems. Byrne proposed that a set of apps and companies could be created to develop a government-as-a-service, which would lead to high levels of efficiency, lower costs and complete transparency, which would in turn lead to a cessation of bribery. 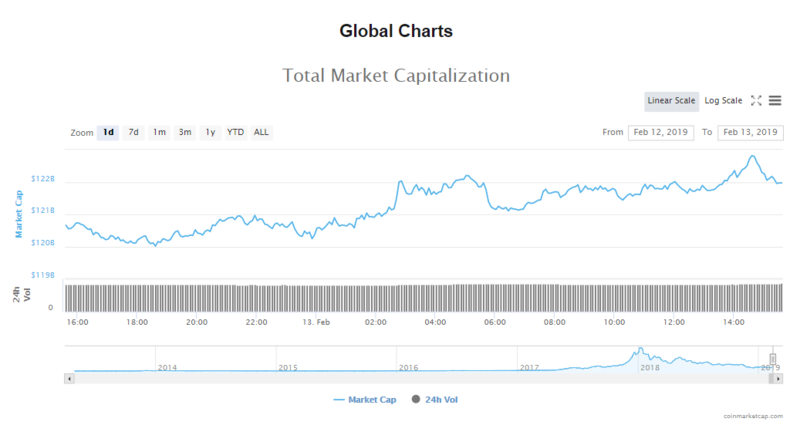 From yesterday, the cryptocurrency market’s capitalization has risen by about $1 billion to its current $121.84 billion. The volumes of trade that the market is currently experiencing is $20.66 billion. The price of the world’s most valuable cryptocurrency is up by 0.39% to $3647.43. Bitcoin’s market worth has also gone up to $63.95 billion and volumes of trade at this point are $6.40 billion. The world’s second most valuation crypto is now up by 2.59% to a trading price of $124.03. Ether’s valuation in the market is $13 billion and its volumes of trade are $3.20 billion. In the last one day, most of the cryptos in the top ten list are now in the green, with EOS leading the charge, up by 6.27%. Ether is up by 2.59% and Bitcoin Cash is up by 2.22%. Binance Coin’s price has dropped by 5.39% since yesterday and Tron is very marginally down by 0.08%. 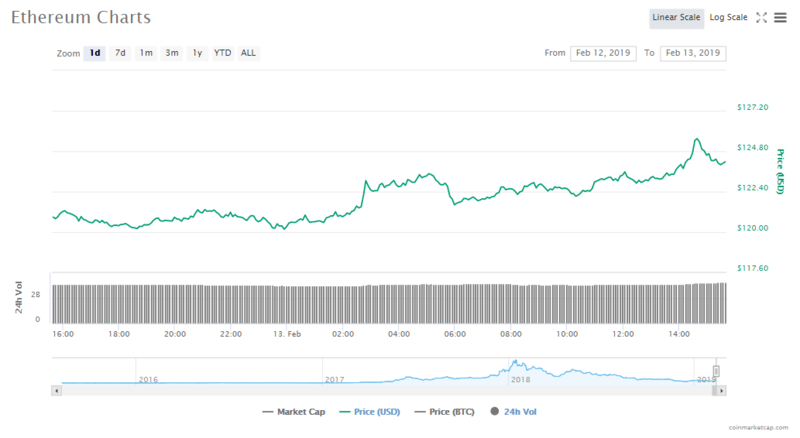 Bitcoin’s token price is $3647.43, increasing 0.39%. Bitcoin’s worth in the market is now $63.95 billion. Ethereum’s token price is $124.03, increasing 2.59%. Ethereum’s worth in the market is now $13 billion. Ripple’s token price is $0.307039, increasing 1.80%. Ripple worth in the market is now $12.65 billion. EOS’s token price is $2.95, increasing 6.27%. EOS’ worth in the market is now $2.67 billion. Litecoin’s token price is $43.69, increasing 0.35%. Litecoin’s worth in the market is now $2.64 billion. Bitcoin Cash’s token price is $124.03, increasing 2.22%. Bitcoin Cash’s worth in the market is now $2.18 billion. Tether’s token price is $1.00, increasing 0.15%. Tether’s worth in the market is now $2.02 billion. TRON’s token price is $0.024587, decreasing 0.08%. Tron’s worth in the market is now $1.63 billion. Stellar’s token price is $0.077588, increasing 0.07%. Stellar’s worth in the market is now $1.48 billion. Binance Coin’s token price is $9.09, decreasing 5.39%. Binance Coin’s worth in the market is now $1.28 billion. The man known as the Oracle of Omaha, the CEO of Berkshire Hathaway and one of the greatest investors of all time, Warren Buffet claimed that buying Bitcoin was not investing. The cryptocurrency markets saw massive movement on Sunday night, with most of the top 20 cryptocurrencies gaining in value. Of the top 20, BCH saw the biggest gains, going up by almost 21% in trading. Russian President Vladimir Putin spoke of the importance of developing blockchain technology in the country. He said that countries that are late in adopting the new technology could fall under the dominance of market leaders. Ripple announced on Tuesday that the London-based Euro Exim Bank would be using XRP for cross-border payments. The bank, which provides financial services to import and export companies, will be the first to announce that it is using XRP for such payments.